Registration is now open for the 2015 USTA Spring Adult League. Women's and men's teams are forming across all age groups and NTRP levels to play singles/doubles. 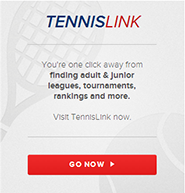 If you are interested in joining the fun, click on the USTA League Tennis menu option to the left for details including format, days of play, and registration information. The team registration deadline is February 8 and the season begins the week of February 22.